Well, I have been to Wayne’s school twice, met his students and had a super time introducing some finer points of Fuzhou Crane Boxing. Wayne is a student of mine and these last years, have been passing on some of the White Crane that he got from me. What can I say, plant a seed and you see a tree and now it’s down to ensuring that the tree grow big and strong. With the dedicated following that Wayne has got in his school – no biggie. I am really pleased to see the art propagating here in Colorado. 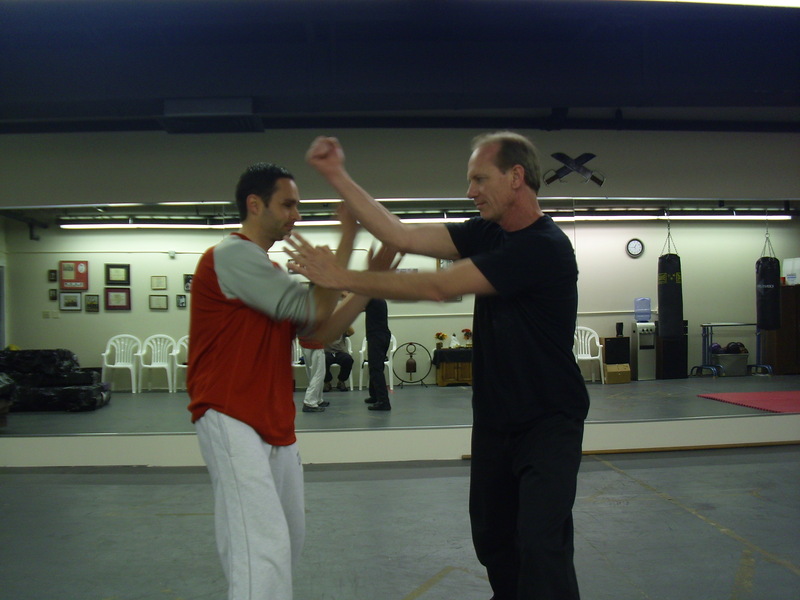 Then there was also one evening that I spent some time at the “Colorado School Of Wing Chun” to play with some old friends. Sifu Phil, Ron and Chad; the latter 2 also White Crane students of mine plus a group of new faces showed up and we were just totally having fun on the training floor. Observing a minute silence at the end of training for our dearly and very untimely departure of Sifu Bart Mann kind of bring home the message; Wing Chun, White Crane…..we are all good friends of Wulin – we are family! And this morning, Wayne, Chad and I again spent time at the Wing Chun school to go through some more White Crane fighting concepts and forms. The weather was brilliant and after the session, we decided to hop over to the famous “Mile High Flea Market” for some turkey legs, burritos and cold beers. Sunshine, cold beers, turkey legs, burritos and good company – what more do you want ? Pic – Wayne in black and Chad in white tees. And before I forget, here are the marsh/gator pictures I spoke about in my earlier entry. It was a gorgeous day when we did this in Tampa, the kind of weather that I am so familiar with. Everything went perfect except that I decided not to put on the head set to muffle the noise from the airboat …. arrrgh… what a big mistake. But it still cool to be able to get so close to wild gators. Highly recommended when you’re in Florida and don’t forget the head set. Excuse me, what is that again? Can you speak up……..
After waiting 4 hrs in Tampa Airport; flight got delayed 2 hrs because of lousy weather, I finally boarded the plane to Denver. So by the time I touched down, it was already past 10pm and Wayne (Hinton) was there waiting. It’s been about 8 years since I was last in Denver and the first reminder of things to come is the “cruel” cold weather – it’s freezing cold. I think I can forget about my sleeveless tees and bermudas – time to get wrapped up if I wanna to go out. The hour long ride in Wayne’s truck saw the 2 of us talking about and updating , non-stop – so much have happened these last few years. 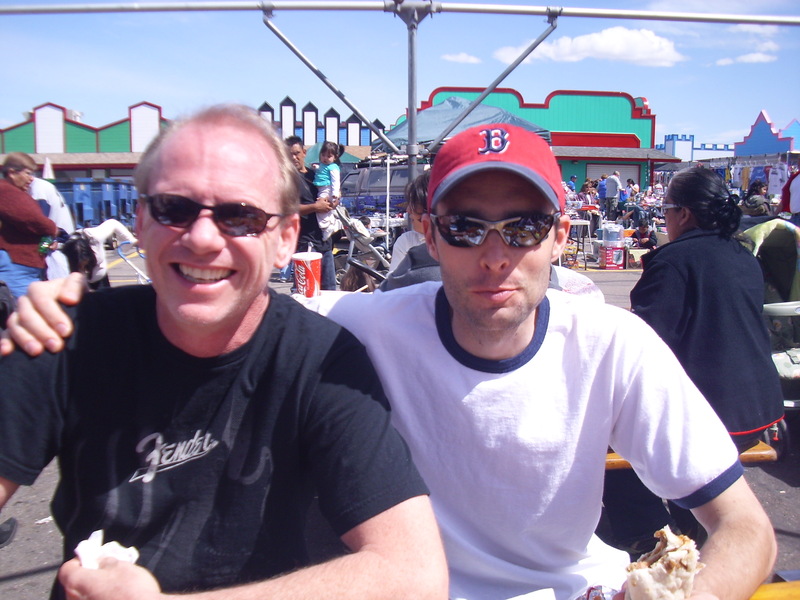 Well, I got 3 weeks planned for Colorado and I hope to visit as many old friends as possible and meet new ones. One thing for certain, there will be much playing – kung fu style. Got here a photo-slide of downtown Denver and 16th Street mall; the place that I used to hang out quite a bit when I was here last. I ask Wayne about the missing street performers and was told that they will be back when it gets warmer. The doggie you see is Festis – Wayne’s dog that I am planning to sneak home in my luggage bags, if I can get Customs to look the other way hahahaha..
And the busy looking dude with his ear glued to the mobile is Wayne. On the move again – feeling like a Hakka…. After about 10 days of intense discussions, touch hands and behaving like a tourist whenever time permits, it’s time for me to pack my bags and head on out to Denver. Got a bunch of pics with me that are waiting for me to transfer and then uploaded for you folks ….. some pretty neat photos of gators when Russ and I went out on a air-boat ride in the marsh… I told Russ I must feel what it’s like to go out on one of those machine with that propeller. Too much “CSI Miami” hahahaha…..
3 weeks planned for Colorado- just about right. Got many old friends to visit; Uncle Bill, Uncle Wayne, Wayne Hinton…….. I have been looking up the weather up there online and I must say that it don’t look agreeable to me; 30s, 40s and high is like 60s ….. brrrrhhh good thing I got a thick jacket with me. Hard to “whip” when muscles and joints are cold. Got another clip here to share – from Russ’ collection again. Taizu from Taiwan, I believe. And before anyone starts thinking it’s all play here in Florida, I just want to (ahem) state that Russ and I have been real busy going through all the plans and projects that we got lined up – these will be updated accordingly through this blog. Plus any free time we find, we are examining & re-examining the arts in our experience; White Crane, Karate, Taizu, Wuzhu,Saolim etc etc. Including going through videos; those found on-line and others in Russ’ collection. Like this one, taken from a documentary about Taiwan masters, another line of White Crane Boxing that I have not personally come across…..
Hehehe, got a friendly message from back home; a week in Florida and only 2 pics?? ?